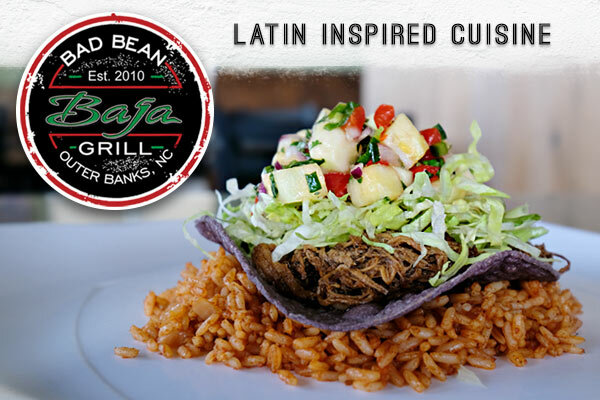 Bad Bean Baja Grill’s varied and unexpected menu and local ingredients have all the answers. Do you want Mexican? This Kitty Hawk restaurant specializes in it. Do you want local seafood? Get each day’s fresh catch here. Perhaps you just want something different, whatever that may be, and you can count on finding it at Bad Bean. Their chef-driven food is inspired Mexican and Latin-American cuisine that’s fused with elements of Baja, Tex-Mex, coastal Carolina, Asia and beyond. They have your tacos, quesadillas and burritos, but they’ve also got you covered when it comes to flavorful salads, wraps and sandwiches. Go for the Giant Cali Burrito for classic Mexican restaurant fare, or shake it up with the Black Bean Quinoa Burger. They’re known for their fish tacos, burritos and wraps, and the Outer Banks seafood is selected by what’s freshest that day. And their popular N.C. Heritage Farm Pork Belly Tacos satisfy both Mexican and barbecue cravings in one, heavenly mouthful. If you have a large group to feed, don't forget to check out their party packs that serve 10 or 20. It’s everything you need for a delicious taco night without the stress of cooking. The menu at Bad Bean Baja Grill has something for every eater. Take your pick of protein from local fish and shrimp, ancho-braised brisket, shredded barbacoa, achiote-roasted chicken and grilled skirt steak. Vegans, vegetarians and those with gluten-free restrictions will have no problem eating and enjoying their experience at the Bad Bean. Various salads, grilled tofu, vegan rice and beans, and house-made hummus can be combined for a delicious and healthy meal. From carnivores to vegans, no one leaves this Kitty Hawk restaurant hungry. Everything – food, sauce, moles, marinades, dips – is made in house, and the chefs take pride in using only freshest of ingredients. The crispy chips are fried that day and arrive at the table still warm, and the homemade salsas burst with robust flavor. You won't find your typical bottled hot sauce on the tables, either. They create and rotate their house-fermented hot sauces on a regular basis. All of their mixers are made here too, and people like to stock up on the hot sauces, salsas, house margarita and house Bloody Mary mixes before leaving the Kitty Hawk restaurant. Speaking of drinks, take a peek at their selection of mojitos and margaritas, including featured concoctions that change each day. They also serve wine and beers by the bottle, and the craft beers on tap rotate regularly. Changes daily, Ask your server. Sliced grilled chicken breast with lettuce, fresh guacamole, crisp bacon and salsa fresca, rolled in a garlic herb flour tortilla with garlic and cilantro fries.